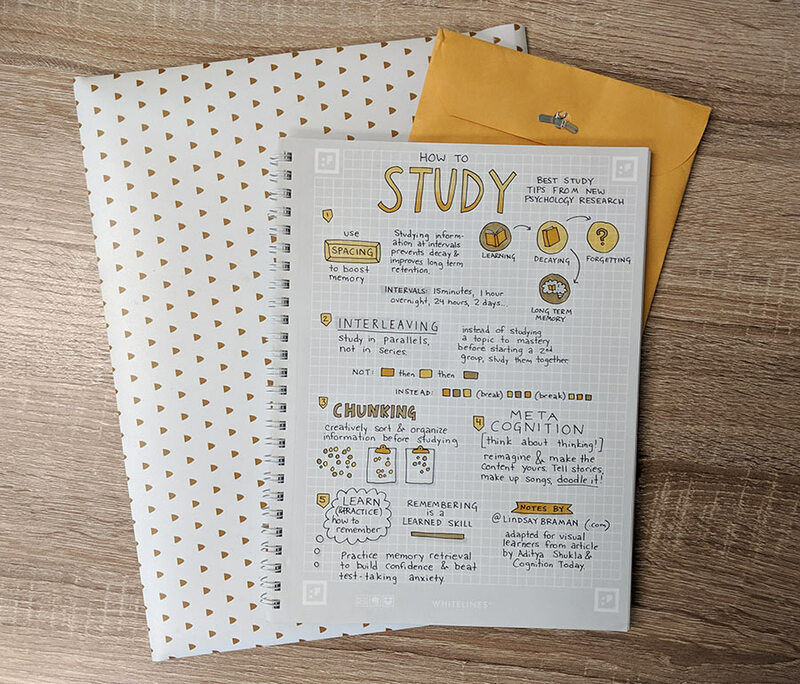 When it comes to studying, most of us probably think we’ve got it down, but modern research is challenging some of the longest-held beliefs about studying. In some cases, these researchers report, counterintuitive study methods work better than traditional study methods. 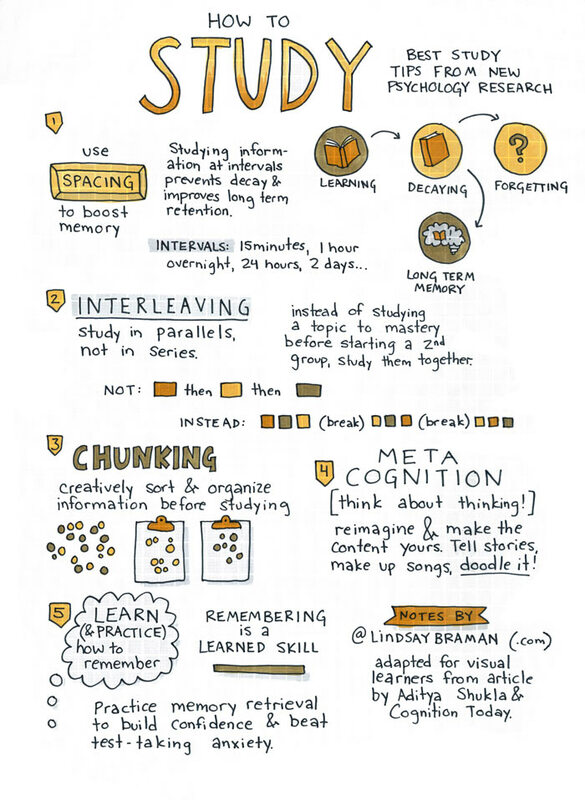 In this sketchnote review, I’ll doodle a few of the top study methods. A written summary and links to original research can be found via Cognition Today. Once we learn something, our memory of it begins decaying immediately. Research indicates that information is best moved into long-term memory not by constant repetition, but by allowing the decaying process to begin and interrupting the decay with repetition at intervals. Your studying intervals might be, at first 15 minutes or one-half hour. As you improve your memory of the material, your intervals might expand to an hour, then overnight, then 24 hours, then three days, etc. Over time, the interval studying method teaches your brain that the information will be needed at intervals in the future, and thus should be stored in the long-term memory. Instead of studying a topic to mastery before you begin studying a second related topic, try studying them together. For example, instead of studying zebras, then lions, then whales, study zebras with lions, then lions with whales, then whales with zebras, etc. Information, as it is presented in class or in a textbook, may not be organized in a way that makes the most sense to you – especially when multiple topics are being covered. 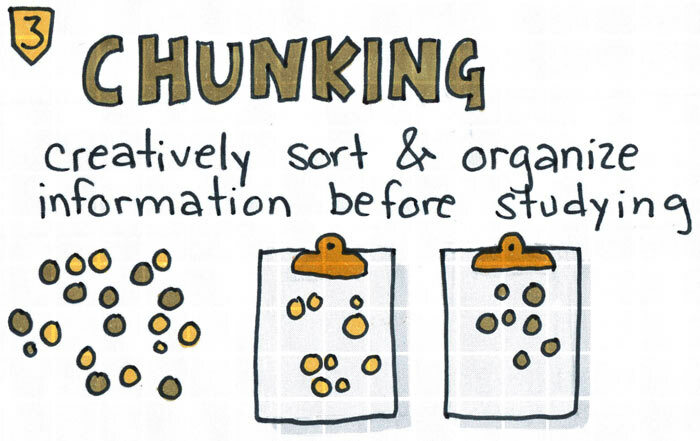 Before you begin committing something to memory, organize it! If you need to memorize a list, you might want to first rearrange the order of the list in a way that makes more sense to you, or in a way that easily fits a mnemonic device. 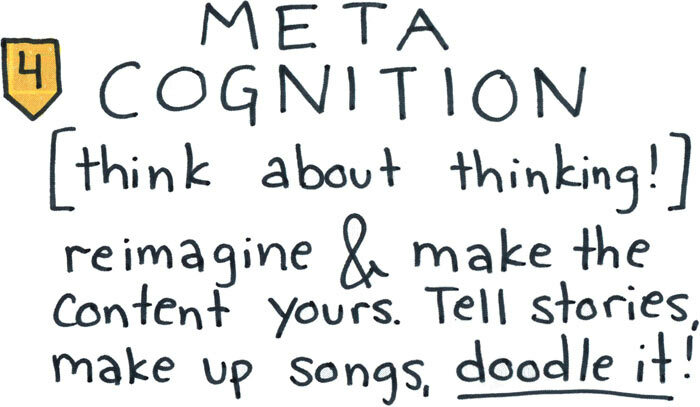 Metacognition is, for lack of a better word, thinking about thinking. As an artist and a therapist, I think about metacognition as letting your imagination PLAY with the information you need to study. Many of us who struggle to memorize lists, facts, or equations, have no problem remembering images, stories, or songs. Knowing this, we can begin to let our creative selves interact with the material – the creative process helps us “own” the content and store it in our brain and easy to retrieve ways. Pairing this with traditional study methods can help store the information in multiple parts of our brain – effectively creating a “backup” for when recall via one method fails during test taking. Associating icons with a list of concepts to memories allows for recall via either left brain or right brain recall techniques. 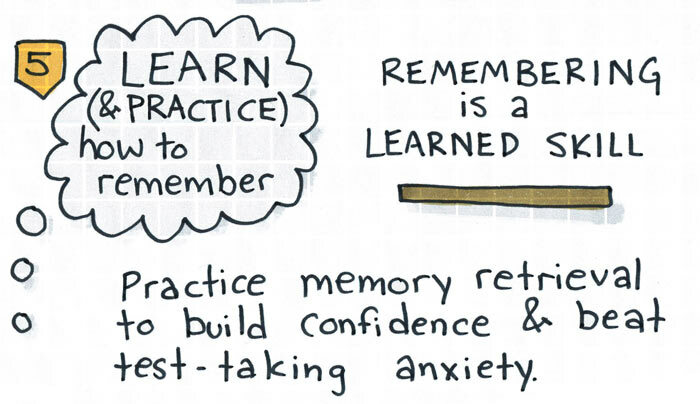 Remembering – especially recall and test-taking – is a learned skill. Reminding yourself of this can help you remain call and kind to yourself when you are struggling with a test. You aren’t struggling because you are “a bad test-taker,” you are struggling because you are in the process of learning how to be a better test-taker. Naming yourself “bad at” something limits growth, but identifying as a “learner” helps you grow and improve. When it comes to studying specific content, practicing recall over and over before a test can help test-taking anxiety. By building your confidence in your ability to recall information on demand, you can help calm your anxiety and focus your mind in the classroom.